County Durham steel firm Finley Structures has invested more than £500,000 in a new state-of-the-art cutting machine to increase capacity and improve efficiency. The family-run business, which has been buoyed with a string of major contract wins recently, has also invested in a new 7,500 sq ft. manufacturing space to accommodate the state-of-the-art machine, which is in addition to the firm’s existing 88,000 sq ft facility on Aycliffe Business Park. 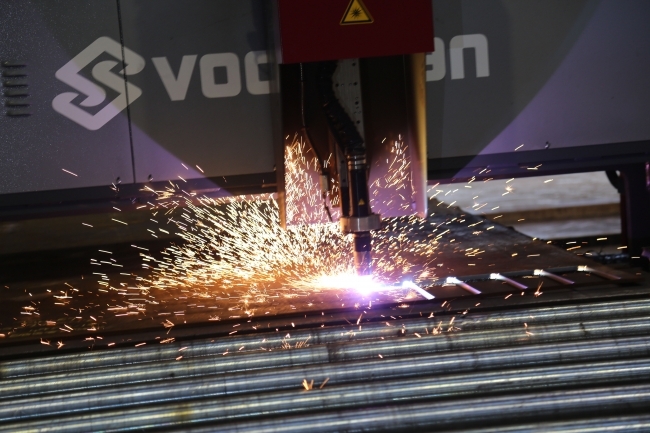 And within months of being installed, the cutting machine has already recorded efficiencies of more than 10%, which is anticipated to increase to 15%, to accommodate a strong order book. Finley’s production controller Philip Metcalfe said: “Our fittings department previously was four men using four machines producing 17.5 tonnes per week – now it’s two men using two machines producing 20 tonnes per week. Finley Structures has been working on a 640-tonne project for main contractor Galliford Try at Durham University’s Maiden Castle sports facility. It was the second major project to be awarded from Galliford Try, with Finley Structures also working on a 930-tonne contract at the CTAR Building in Leeds. Finley was also boosted with a triple contract win from major national firm BAM Construction towards the back end of 2018. The firm has fabricated and erected 380 tonnes for the Advanced Wellbeing and Research Centre (AWRC) for Sheffield Hallam University. Also at Sheffield Hallam, Finley Structures constructed 130 tonnes of steel for the National Centre of Excellence for Food Engineering (NCEFE) which is already at the centre of an expanding network of business, industry groups, academics and engineers working to solve specific business challenges within the food and drink sector. And the Aycliffe construction specialists is also in the process of fabricating 820 tonnes of steel for a new five-storey building for BAM Construction at New College Bradford, which is due to be fully completed by September 2019. Finley Structures was formed by John Finley in 2000 and has since worked for nearly all of the UK’s main contractors in the construction business, including Sir Robert McAlpine, BAM, Tolent, Interserve, Bowmer & Kirkland and Galliford Try. The firm has worked on projects the length and breadth of Britain, while also helping to construct some of the most high-profile buildings in the North-East, including Hitachi Rail Europe’s train assembling factory in Newton Aycliffe, Nissan’s car plant in Washington, Nifco’s state-of-the-art factory in Eaglescliffe and Teesside University’s award-winning Curve building in Middlesbrough.